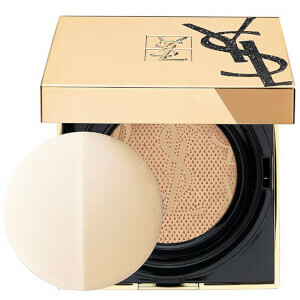 Add a flush of colour to your complexion with Yves Saint Laurent’s limited edition Mon Paris Blush Palette; a compressed powder blusher with a super-blendable, lightweight texture that adds a sheer hint of rosiness to cheeks. Encased in the brand’s iconic gold compact adorned with lace lavaliere and enhanced with precious jewels, the exclusive palette is a must-have for a healthy illuminating glow. Talc, Calcium Sodium Borosilicate, Isononyl Isononanoate, Magnesium Stearate, Synthetic Fluorphlogopite, Dimethicone, Diphenylsiloxy Phenyl Trimethicone, Alumina, Methicone, Caprylyl Glycol, Calcium Aluminum Borosilicate, Silica, Magnesium Silicate, Tin Oxide, [+/- May Contain Ci 77891 / Titanium Dioxide, Mica, Ci 77491, Ci 77492, Ci 77499 / Iron Oxides, Ci 77007 / Ultramarines, Ci 75470 / Carmine, Ci 15850 / Red 7, Ci 45410 / Red 28 Lake, Ci 77742 / Manganese Violet, Ci 15985 / Yellow 6 Lake, Ci 77163 / Bismuth Oxychloride, Ci 19140 / Yellow 5 Lake, Ci 42090 / Blue 1 Lake, Ci 77510 / Ferric Ammonium Ferrocyanide.